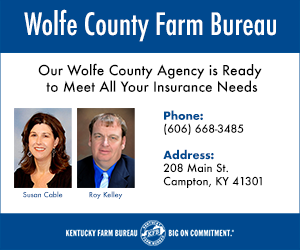 BROOKLYN, N.Y. – In what has become an annual tradition for the Kentucky men’s basketball program, it was more of the same as three Wildcats achieved their dreams when they heard their names called in the 2017 NBA Draft. De’Aaron Fox (No. 5, Sacramento Kings), Malik Monk (No. 11, Charlotte Hornets) and Bam Adebayo (No. 14, Miami Heat) were selected during the 2017 draft on Thursday. Fox is the 12th UK player since 2010 to go in the top seven picks. Monk and Adebayo added to UK’s lottery selections in the last eight years under John Calipari as UK’s mark reached 17. The trio taken in the top 14 of the draft upped the Wildcats’ first-round selections to 24 under Calipari since 2010. “Wow, what a night,” Calipari said. “We’ve been doing this a while now but this will never get old for me and I hope it doesn’t for our fans. This is graduation night for our program. My stomach was in knots all night waiting to hear our guys’ names called, but there is nothing better than seeing the overwhelming emotions come over our players and families when their dreams come true. The Wildcats have had more top-10 picks, more lottery selections and more first-round picks in the Calipari era than any other team in the country. “I mean, it’s extremely gratifying for me to be in that top five, and we already knew that this was going to be a pretty tough draft and it was pretty loaded at the point guard position, and for me to be up there is just a blessing,” Fox said. In eight seasons with Calipari at the helm, Kentucky has churned out three No. 1 selections, 24 first-rounders, 17 lottery picks and 31 total players in the NBA Draft. The 31 draft picks is more than twice as many as the next school (Duke and Kansas) since 2010. With another surge of first-round picks, Kentucky has more first-round selections (37) than any other school in the NBA lottery era (since 1985). Kentucky has now had 122 players drafted 124 times in its illustrious history with 47 players selected in the opening round. “This has been my dream forever, and nobody ever from my town ever been drafted, ever made it this far, so I’m just thankful to be here,” Monk said. It is the eighth consecutive NBA Draft that Kentucky was represented by multiple players in the first round of the draft. UK is the only program since the draft went to two rounds in 1989 to have multiple players selected in the first round in eight straight years. Calipari is the only coach to have multiple players selected in 10 consecutive NBA Drafts, dating back to his time at Memphis. Fox was UK’s first player off of the board when he was selected fifth overall by the Sacramento Kings. He’s the 10th player in program history to be selected by the Kings. With the Houston, Texas, native going fifth overall, UK has had at least one player taken in the top seven in each of the last eight drafts. Faced with the unenviable task of replacing 2016 Bob Cousy Point Guard of the Year award winner Tyler Ulis, Fox filled his shoes admirably this season and made his mark as one of the nation’s fastest and craftiest players. He averaged 16.7 points, 4.6 assists, 4.0 rebounds and 1.5 steals, one of only four freshmen in the country to average at least those numbers in all four categories. Markelle Fultz (Washington), Dennis Smith Jr. (NC State) and Michael Weathers (Miami, Ohio) were the others. A four-time Southeastern Conference Freshman of the Week selection, Fox was named the most valuable player of the 2017 SEC Tournament after leading the Wildcats to their third consecutive title. In addition to All-SEC First Team honors by the Associated Press and the league’s coaches, Fox was named a third-team All-American by USA Today and CBS Sports. Fox’s 4.6 assists per game was the best mark in the SEC and 11th nationally among freshmen. The Houston native also ranked fourth in the SEC with a 1.9 assist-to-turnover ratio. His scoring average was sixth in the SEC and 10th nationally among all freshmen. His 165 assists are the third most by a UK freshman in a single season. Fox’s two crowning achievements this season are a toss-up. He posted just the second triple-double in school history and the first since Chris Mills in December of 1988 when he recorded 14 points, 11 rebounds and 10 assists in a dominating victory over Arizona State. 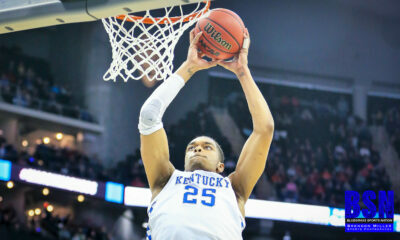 Perhaps saving his best for last, Fox scored a record 39 points in the victory over UCLA in the Sweet 16. According to ESPN Stats & Info, the 39 points are the most ever by a freshman in an NCAA Tournament game. Monk became UK’s second selection in the opening round when he was taken by the Charlotte Hornets at 11th overall. He is the fifth-ever selection by the Charlotte Hornets in the history of the program. The Lepanto, Arkansas, native electrified crowds with his prolific scoring outbursts and high-flying violent dunks. He finished his freshman season averaging 19.8 points per game – second among all freshmen nationally – and reached double-figure scoring in all but two games. A consensus second-team All-American, Monk was also the Associated Press’ SEC Player of the Year and the SEC Freshman of the Year, as chosen by the league’s coaches. With 14 points in the NCAA Tournament second-round game vs. Wichita State, he became UK’s all-time leading freshman scorer with 721 points, passing Jamal Murray’s output of 720 from a season ago. His record-breaking season ended with 754 points. That’s fourth all-time in UK’s history books, regardless of class, trailing only Dan Issel (948; 1970), Jodie Meeks (854; 2009) and Jamal Mashburn (767; 1992). He produced 18 games of 20 points or more, including a Kentucky freshman record 47 points vs. North Carolina in December. Monk is the only freshman in program history with four 30-point games, and six times this season he scored at least 20 points in a half. In addition to scoring 37 points at home vs. Georgia and 30 in a half against Georgia, he hit the game-winning shot vs. North Carolina and the game-tying shot to force overtime in the win at home vs. the Bulldogs. Monk made 104 3-pointers on the season, not far behind Jodie Meeks’ school record of 117. Adebayo was the third Wildcat selected in the lottery when he was picked 14th overall by the Miami Heat. He is the first Kentucky player ever taken by the franchise. Like Anthony Davis and Karl-Anthony Towns, who developed at Kentucky and went on to become NBA superstars, Adebayo evolved into an unstoppable post presence as the season progressed. The 6-foot-10 freshman from Little Washington, North Carolina, was arguably UK’s most effective player over the last month and a half, averaging a double-double during the Wildcats’ late-season 14-game winning streak. For the year, Adebayo averaged 13.0 points and a team-best 8.0 rebounds per game. He also led the team in blocks per game (1.5) and double-doubles (eight), including five double-doubles over his last 11 games. He was a member of the All-SEC Second Team and was also named to the All-SEC Tournament Team during his successful freshman campaign. Playing in a guard-heavy lineup, Adebayo provided UK with its most consistent inside presence. His .599 field-goal percentage was the best among players attempting at least 100 shots for the season, and his 101 dunks on the year are more than any other Kentucky player under Calipari. Davis had 92 during the 2011-12 season. Adebayo took his game to another level starting in February. He followed a 22-point, 15-rebound game at Missouri with an 18-point, 15-rebound effort vs. No. 13/12 Florida, accomplishing a pair of milestones in the process. 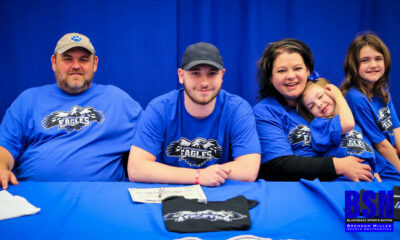 His back-to-back double-doubles were the first of the season and put him in the team lead with five, while his back-to-back 15-rebound games marked the first such stretch since Jared Prickett accomplished the feat on Feb. 6 and Feb. 9, 1994. It was the first time a UK player had posted back-to-back games of at least 15 boards in consecutive SEC games since Sam Bowie on March 1 and March 3, 1984. In the opening NCAA Tournament game vs. North Kentucky, Adebayo collected 18 rebounds, the most boards under Calipari in an NCAA Tournament game at Kentucky and the third most all-time in UK history in the tournament. Per ESPN Stats and Info, he became just the second UK player (Julius Randle in 2014) with a double-double in each of his first two NCAA Tournament games. Kentucky has had 122 guys drafted 124 times (Johnny Cox ’58 and Roger Newman ’60 both drafted in Jr. eligible draft, but returned for senior year and were drafted again). UK has had 47 players selected in the opening round (24 have come in the last eight years) of the draft. Kentucky has had 31 players selected in the draft over the last seven years, more than double the next-closest school (Kansas). Kentucky has had 12 players selected in the top 10, 17 in the top 15 and 24 in the first round of the draft in the last eight years. Caliparihas had two or more players selected in 10 consecutive NBA drafts dating back to 2008 with Memphis. In 25 seasons as a head coach, Calipari has coached 42 NBA Draft picks, including 30 first-round selections with 15 of those going in the top 10. He has had 31 selected in the last eight years as UK’s head coach, including 24 coming in the opening round. 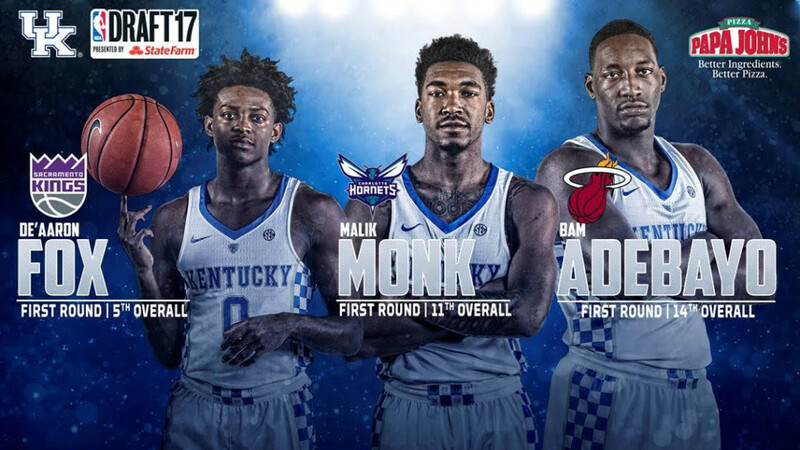 With Fox, Monk and Adebayo’s selections in the 2017 NBA Draft all 21 freshmen who have declared for the draft following their freshman season under Calipari have been drafted in the first round. For the latest on the Kentucky men’s basketball team, follow @KentuckyMBB on Twitter, Facebook and Instagram, and on the web atUKathletics.com.